attending, I guess it is up to me to post this list. I am not as good as him at seeing what others are playing, so please add games I am missing. Several people were playing Android: Netrunner at the Meetup. Chris was running a Android: Netrunner tournament, so I know this was played. 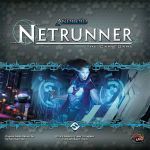 At least six of us played this game while the Android: Netrunner tournament was going on. Ian played with Chris' friend Rick. It was a new game for Rick. I know they had 100 point built squads. Ian played the Rebel Alliance, and Rick played the Galactic Empire. I know Rick won the game. All I remember about their game was seeing what looked like about 5 ships all touching each other in the middle of the board. My son and I played right next to them with our own 100 Point squads. It is a new game for us this month, and we have played it a lot. I played the Rebel Alliance, and my son (14) was the Galactic Empire (as always...he is in a Sith phase right now). I had the Falcon with Han Solo (with Upgrades) and 2 Rookie X-Wings, and he had Boba Fett/Slave I, 2 Tie Fighters, and a Tie Interceptor. It came down to Slave I vs. The Falcon, and I won with 7 Hull left. My son pretty much figured it out. I took out his Tie Interceptor very quickly before he ever got to use it. He made a turn that put him just 2 distance away in front of the Falcon. I has some Missiles as an upgrade, and gave him a critical hit that couldn't fire his weapon the next turn. Then I just stayed right behind him and finished him off. I had a slight edge from then on, and that was all I needed, as I won a pretty close game. That was the most ships we had ever played with a 1 vs. 1 game. It took us at least 2 hours to play, but we had a great time. There were at least two others playing next to us as well. He had painted miniatures and 3D terrain. My son was very impressed with their setup. PS: To Ian: I doubled checked the 100 Point Squad again in the File section here, and it was my mistake. The file is correct. My son, me, Chris, Ian, Rick (Chris' friend), and Afshin played a 6 player game with all of the expansions (though we only used some elements of the newest Daybreak Expansion). I really like this game. 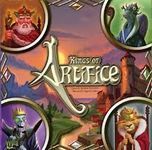 I liked it from the first play, before I had played games like The Resistance, The Resistance: Avalon, Shadows over Camelot, or BANG!. It was just a great game to play for me without even getting into the the traitor mechanism. I have some pretty good skills at The Resistance. But there is a lot going on this game that can distract you. But I am still pretty good picking out the Cylons (I have never been one yet) if I concentrate and don't get distracted by the Cylon Fleet and the menacing loss of population/food/fuel/morale. 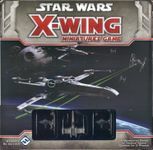 Afshin showed that experience in this game can overcome any skills I possess in detecting Cylons. We played his copy, and he has played this way more than any of the rest of us. I thought he might be a Cylon near the start of the game. Even his "Why?" questions to my accusation made me pretty sure I was right. But then he showed his experience. He started helping the humans a lot. He got way off my radar. The problem was that both he and Rick were Cylons from the start. Nothing changed when we got to Kobol. I assumed with my limited playing experience there was only one Cylon out, so when an obvious Cylon move came out with 4 players putting in cards (Afshin wasn't one of them), I started trusting him. Afshin concealed himself masterfully until just the right moment. The other problem was that my son said he was a Cylon from the start of the game. That was done specifically for me, since he was trying something new to confuse me. It worked, since it took me a while to figure out what he was doing. But he also confused the other humans as well. I was Callie, so I was going to shoot someone in the head. Ian was trying to convince me to shoot my son, but by then I knew my son wasn't a Cylon. That made me wonder just enough whether Ian or Rick was the Cylon that I didn't shoot Rick. Meanwhile, Afshin was quietly helping us out, making me forget I thought he was a Cylon. By the time I realized Ian was just confused and Rick was the Cylon, Afshin outed himself by playing a card that executed me right before (I was to his left) I was going to execute Rick. We were on our last jump track when the Cylons both revealed themselves before we could do anything. They sent the Jump Track back to Start with a Reveal Cylon Action when we were ready to hit the FTL for the win. Then Afshin officially revealed himself and sent our Morale to 0 for a Cylon win. 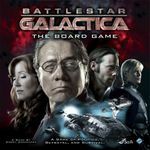 I am pretty sure while we were playing Battlestar Galactica: The Board Game, I saw this come out for a play. Jonny, Jason and another gamer were playing this during the Netrunner tournament. This game was actually designed by Jonny! Matt and Johnny played Ginkgopolis while BSG and Lords of Waterdeep were being played. Pretty sure this was also being played during the Netrunner tournament. 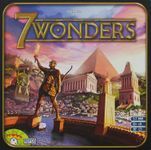 Possibly a 5-6 player game w/an expansion or two.